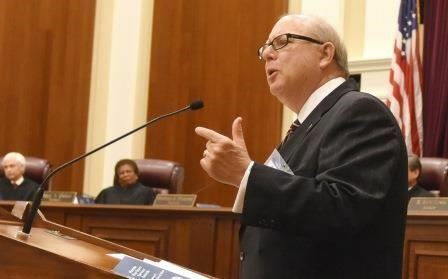 Attorney Bruce B. Blackwell of Winter Park, a founding partner of King, Blackwell, Zehnder & Wermuth, P.A., in Orlando, Historical Society Trustee and Past President, now CEO/executive director of The Florida Bar Foundation, was presented with the 2016 Tobias Simon Pro Bono Service Award at a Jan. 28 ceremony at the Supreme Court of Florida. The award, the highest statewide pro bono award, commemorates the late Miami lawyer Tobias Simon, who was a tireless civil rights attorney, a crusader for prison reform and an appellate authority. For Blackwell, more than 40 years of pro bono service has meant not just the direct representation of clients but also recruiting others to provide pro bono representation and lobbying to strengthen and preserve the network of legal aid organizations serving the poor. In 2014, Blackwell showed his commitment to service by retiring from the firm he helped to found and becoming only the second CEO/executive director in the history of The Florida Bar Foundation. Blackwell was interim director for three months and then, when asked, took the full-time position. He became CEO at a difficult time, as low interest rates depleted the Foundation’s reserves at the very time that access to justice was becoming such a crucial issue in Florida. “This was a call I just had to answer, as the Foundation is simply too important,” Blackwell said. Beyond his work with the Foundation, Blackwell has donated thousands of hours of direct pro bono services. A fifth-generation Floridian, Blackwell graduated from Florida State University College of Law.